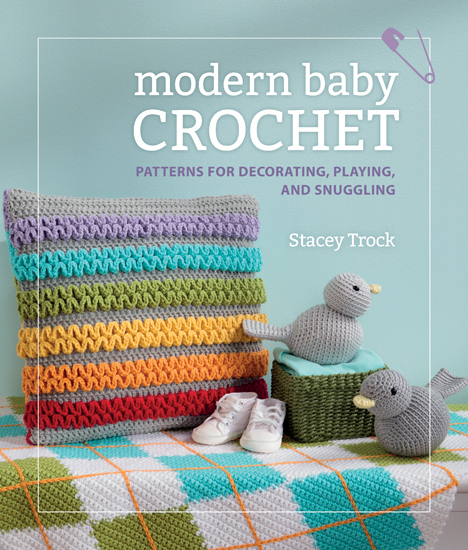 Modern Baby Crochet by Stacey Trock is a great beginner’s book. 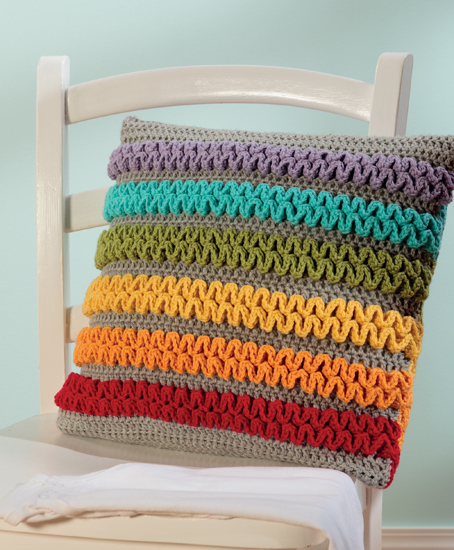 I particularly love that the book goes over the basics of crochet first, as well as several techniques like changing colors, weaving in ends, surface crochet. Unlike my mother, who is really great, I’m terrible at crochet. So, I was really pleased to see that Trock chose to include beginner basics. I like that it’s not all baby blankets, although I love the Asymmetrical Basket-Weave Blanket. There are several toys like the Bubble Ring Rattle, Sea Urchin Pouf (which I love and want for me), and Sweet Tweeter (how cute is that name?). I have a soft-spot for crochet toys. They’re small, easy, and offer relatively quick satisfaction. The Sea Urchin Pouf would be a little less quick to the satisfaction, but I would love a few of these to toss all over the living room. I really want the Colorful Wiggle Pillow, too, but it’s labeled experienced. I know, I know. I tout fearless knitting but am a fearful crocheter? But I don’t have the skills for this pillow yet. I have a hard enough time crocheting an even swatch. With some practice, though, I’m confident I could tackle this. I really like the bright rainbow-like colours, but wouldn’t it be gorgeous in a gradient? This is going in my queue. As I mentioned earlier, Trock also includes a large abbreviations and glossary list, which I love. Those are especially important to have for beginners. I’ve come across a few crochet books that I would love to try but that don’t include these. I’m not against having to do my own research/Googling things, but if I don’t have to, I’m happier for it. All-in-all I think this is a great addition to any aspiring or proficient crocheter’s library. No babies in your life? No problem. Several of the projects could easily fit into any “grown-up” home. There are definitely a few things from this book I’d like in my own home. I definitely recommend checking out this book. Please note: I received a free digital copy of this book from Martingale for review. I did not receive any payment or anything for this review. All of the links in this post go directly to the product page or Ravelry page, not to an associate’s or commission page. The cover and the photographs come from Martingale’s product page, and credit for the beautiful photography goes to Brent Kane. Im pretty crap at crochet. Well, I can do it easily if I watch someone do it and follow them. but following a pattern, oh no, Im terrible! I watched a video series on youtube last week on how to read the charts and crochet from them. I feel like I could crochet anything from charts now.. but patterns argh, still cant do it! That material makes you want to snuggle! !